Have you ever wondered how you are going to stay warm and cook your food if the power goes out? 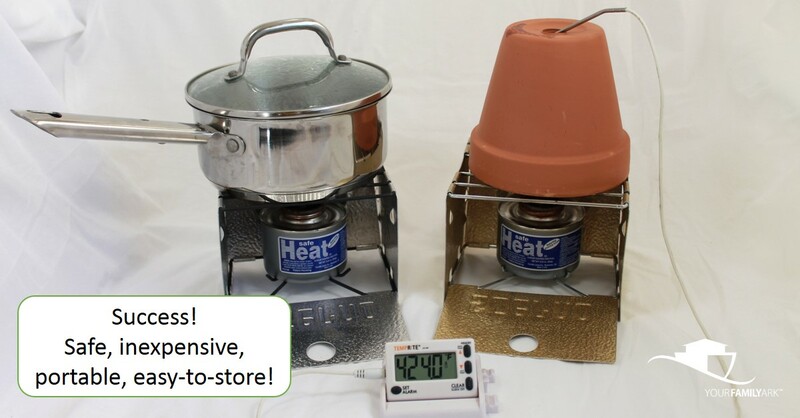 A terracotta pot heater/cooker is an inexpensive homemade device which can double as a heater and stove. Through a bit of trial, error and good science, we have designed an inexpensive solution that can do both. It can provide a cozy little corner in your home and produce a nice hot cup of cocoa. Electricity is a wonderful tool that we take for granted. A power outage can be much more than just an inconvenience. It can be dangerous. Preparing in advance for life without power can turn what may have been a disaster into a grand adventure. The risk of carbon monoxide poisoning is real and must be prevented by using fuels appropriately indoors. Safely heating and cooking indoors without power can be a challenge. We decided to explore inexpensive safe options for heating and cooking indoors. This idea began to take shape when I watched a viral video demonstrating how to heat a room using tea lights, flower pots, and a bread pan. Could it really work? Yes and no. Jonathan and I were concerned with the stability and safety of the original setup illustrated in the video. The concept was quite promising and we hoped to discover a safer design, but it had to be affordable. We went to work using his engineer brain and my crazy energy trying all sorts of interesting variations. The final result of our exploration has resulted in an inexpensive, versatile, and much safer method that really works! While I would not use this method for everyday heating and cooking, it just might come in very handy during a power outage. In the video, four tea lights are placed in a bread pan and lit. Then a smaller terracotta pot is placed upside down over the bread pan and the hole is covered to prevent the heat from escaping the inner pot. A second pot is placed on top of the smaller pot. The heat is channeled through the pots and a convection current is created providing a nice localized heat. The air coming out of the top of the second pot was between 250-400° F.
Our biggest concern was the stability of the design. It was top-heavy and could easily be knocked over. That would never do in an emergency with little curious hands fascinated by the open flame. We improved upon the design by utilizing a round pan and cooling rack to create a more solid base. One drawback in the design was the tea lights which had to be changed every few hours which meant handling hot pots. We were determined to find the best solution. What about canned heat? One can produces more heat than a few tea lights. In order to use the can we needed a deeper container and tried using a few kitchen pots with cooling racks over them to hold up the terracotta pots. It worked well and produced a little more heat. 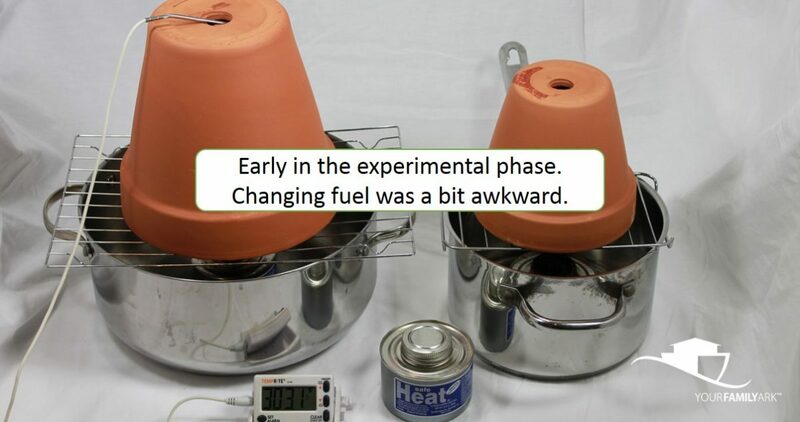 This too presented challenges when changing the fuel. We were still concerned about the set up. It would absolutely work in an emergency, but could we make it better? We went back to the drawing board and finally came up with the perfect solution. The folding camp stove is stable, compact and keeps the source of the heat just off the surface to prevent damage to the table or counter top. It was easy to light, extinguish, or replace the can without having to touch the hot surface of the pots, increasing the safety. It was the perfect solution. The results are awesome! This design is a viable solution for anyone who lives in an apartment or who doesn’t have the financial resources to purchase a more expensive option. 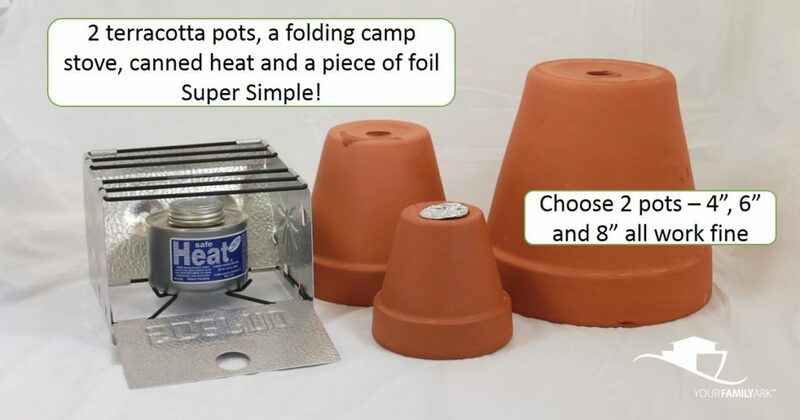 One portable folding camp stove ($12), two terracotta pots (only $8-9), and canned heat ($2-3 a can when purchased in a case) can take care of cooking and provide a little space heating during a short term power outage. It’s not much money to turn a disaster into a comfortable adventure. • Two different sized terracotta pots (4″, 6″ or 8″ all work great). • A portable folding camp stove – this versatile stove allows you the flexibility to cook and heat using the same equipment. Spend a couple of extra dollars on a good stove. The cheap versions are just not as sturdy. • Canned heat – is an alcohol based fuel which is used indoors by caterers to keep foods warm during serving. There are several different brands, just make sure the one you choose is rated for indoor use. Burn time may vary significantly, so be sure to check the can so you know how long it will last. 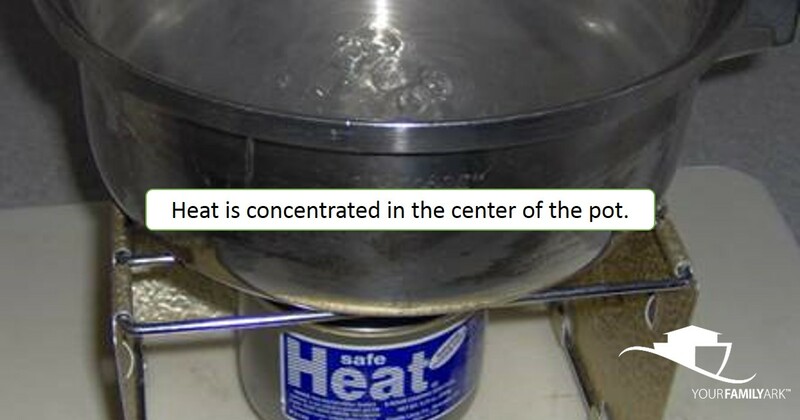 • A small piece of foil or other non-flammable material to block the hole on the smaller pot. Canned heat is available under brand names such as SafeHeat, Sterno, Member’s Mark and Choice. Be sure that you choose one which is rated for indoor use. Burn times range from 2-6 hours. My preferred brand is Safe Heat which is safe to use indoors. Each can of Safe Heat will burn for 6 hours. I keep several cases on hand at all times. Canned heat puts out a visible flame and a good amount of heat. The heat and flame go straight up, with little spread, concentrating the heat in one spot, thus requiring frequent stirring to avoid scorching the food. The cans are filled with forms of alcohol or petroleum gel which are flammable, but do not burn quickly. 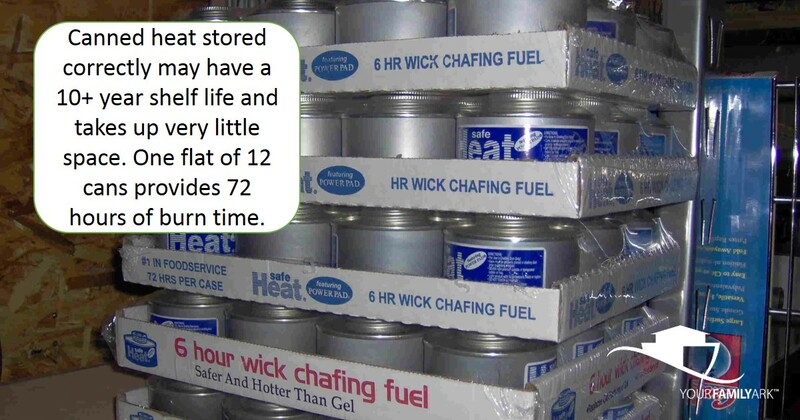 Catering varieties of canned heat are safe to burn indoors with adequate ventilation. They are lightweight and store nicely in flats of 12. The shelf life varies depending on the manufacturer, and ranges between a few years to indefinite. Safe Heat can be stored indoors. Store with the lid tightly sealed to prevent evaporation. We have canned heat in our storage that it 10 years old. It burns as well as the day we purchased it. Store cans between 40°-120°, upright, away from heat sources, and dispose of damaged or dented cans. Start by assembling the folding camp stove. Then place the smaller pot upside down on the camp stove, add a piece of foil over the hole and place the larger pot upside down over the smaller one. The canned heat is placed in the camp stove. The heat is channeled through the pots creating a convection current and the terracotta pots are ideal for accumulating heat in thermal mass. Our terracotta pot heater reached well over 400°F. Be sure to place the heater on a non-flammable surface and keep all combustibles away from it. Once this heats up it is a bit too hot to touch with bare hands. It is important to note that the terracotta pots do not increase the amount of heat produced by the tea lights or canned heat. The thermal mass of the pots collect the heat and it becomes a concentrated heat source. Radiating a nice warmth into the immediate area. Never leave it unattended! The folding camp stove and canned heat is a great little device for emergency cooking. The heat source is concentrated in the center so remember to stir frequently to avoid scorching the food. Great for everything from boiling water, to reheating canned foods, to frying up bacon and eggs. Yum! Open flame increases your risk of a fire and requires great care. Clean alcohol does not produce carbon monoxide as a byproduct of combustion; however, any flame may produce carbon monoxide without adequate ventilation. A working smoke and carbon monoxide detector is important! Accidents happen easily and fires spread amazingly fast. Be sure to provide adequate ventilation when burning anything, including candles or canned heat. Always exercise great caution when using open flame! Never blow out the flame on canned heat. Take the lid and gently place it over the flame to smother it. Allow the can to completely cool before tightening the lid. Good luck getting the lid off if you screw it on tight while it is warm. Trust me! Our public utilities are quite reliable and most of the time we have electricity available at the mere flick of a switch. We are highly dependent on power and this luxury can woo us into a false sense of security. What happens when the power goes out? Are you ready? Severe weather can cause outages that may last hours or weeks. Natural disasters can result in much longer power interruptions. Utility companies are taking new precautions to protect against the constant threat by hackers who could take down the grid with a few key strokes. How will you keep you from freezing and cook your food when the power goes out? Carefully explore the options available to you, create a plan and implement it. 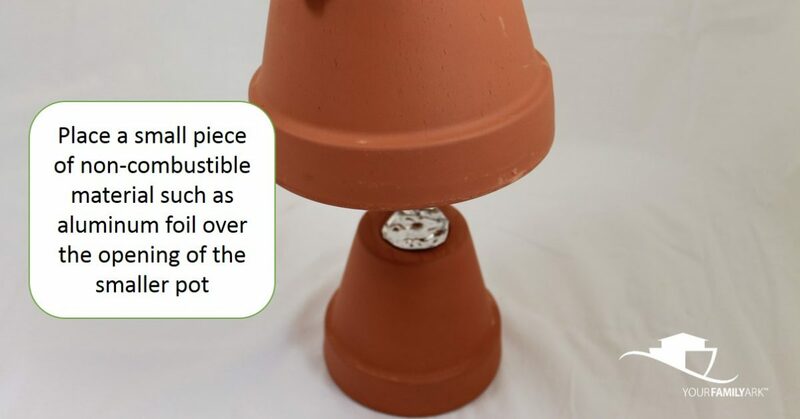 We think a terracotta pot heater is an ideal option. It is a simple, inexpensive device that will do the job. However you plan to heat and cook during an emergency, make sure to practice, practice, practice! It is a good idea to work out the bugs while you can still run out to fast food when dinner burns. 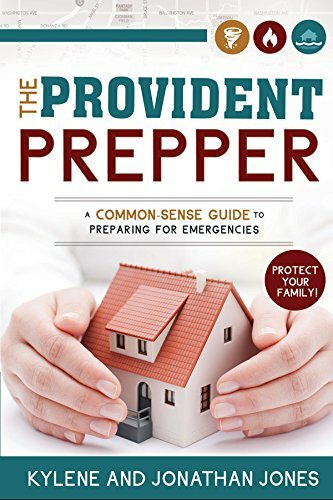 A little preparation now means that when disaster strikes you will have the tools, skills and confidence to thrive and turn the challenge into a grand adventure.